Insofar as imagination is concerned, certain tasks are easy. It might be relatively easy to visualize the beauty we want to see, to imagine music we would want to hear, and even imagine pleasure — or pain — depending on the scenario. But what I believe is most difficult is imagining how something new would taste– say a new dish, or an existing but re-imagined one. Not only do these require imagination. They require a lot of patience. They require a palate that is so confidently instinctive. Some people, I suppose, are naturally blessed with such instinct. Others get it by investing enough time in the kitchen. Now, that is what I call a sense of taste. I’ve always admired people who turn their culinary imagination into reality. One of them is the owner of a top-rated restaurant in Chicago known for its fusion fare. I will write about her place soon, so bear with me if I don’t name the resto yet. 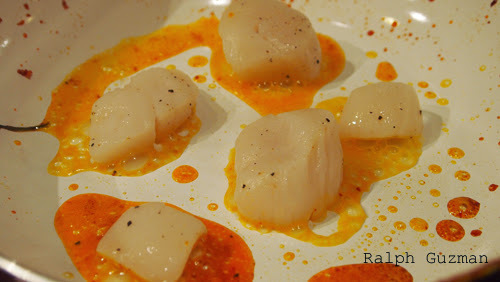 But when I ate at the place, the dish that truly captivated me was her seared scallops. The combination of ingredients was so unusual, I worried that the ingredients would clash with each other. To my most pleasant surprise, the dish was so delicious, it was my top pick for that restaurant. On second thought, make that my top pick for that entire trip to the States. I’d go back to Chicago anytime if I could. But Chicago is thousands of miles away. As they say here in the Philippines, Chicago isn’t exactly Quiapo. What to do? I settle for the next best thing– recreating and re-imagining the dish! The result: my own version, Seared Scallops on Buttered Kimchi. Well, these two ingredients don’t sound out of this world yet. But the kimchi is buttered, and it includes toasted hazelnuts and dried figs. Now, how does that sound? It’s very easy to make. I started out by toasting the hazelnuts (about 1/2 cup). I opted to put the nuts in a pan (you can use your oven or oven toaster too). Remove the skin and set aside. Using the same pan, I melted butter and sauteed the kimchi. I’m not really strict with the measurements. But for purposes of discussion, I did use an 8-oz jar (1 cup) of the Korean favorite. I sauteed it in medium heat for about 2 minutes. While sauteeing, add lemon juice. I then added the dried figs (about half a cup’s worth), with each piece chopped into halves. 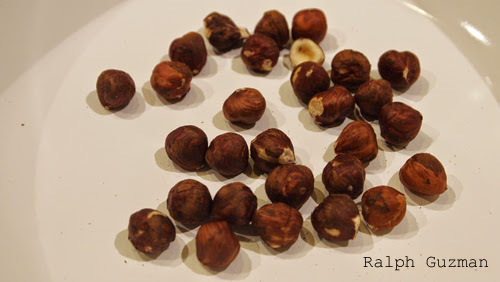 Add half of the hazelnuts you have. I maintained the heat for another 2 minutes so that the figs would soften and absorb the liquid from the kimchi and lemon. Add pepper. No need to put salt. I then put the mixture onto my serving dish, which I set aside to work on the scallops. By the way, I marinated the scallops in lemon juice a few minutes before cooking to remove any unwanted fishy taste. And I sprinkled salt and pepper. Using the same pan, just sear the scallops. I wanted the scallops to get the kimchi flavor, so I still used the liquids from the kimchi mixture. I waited a few minutes until the scallops started to brown on the edges. When you reach this point, take the scallops out. 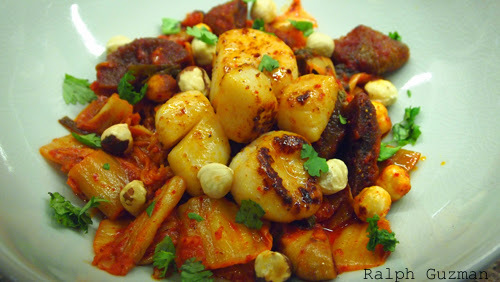 Top the kimchi mixture with the scallops and the remaining hazelnuts. For additional color to the dish, I added chopped cilantro — which also did add extra dimension to the dish. That’s it! How does it taste? While it tasted somewhat different from the original inspiration, it had pretty much the same effect on my palate. And it was a good reminder of what I had. It was love at first taste. The ingredients all worked together. 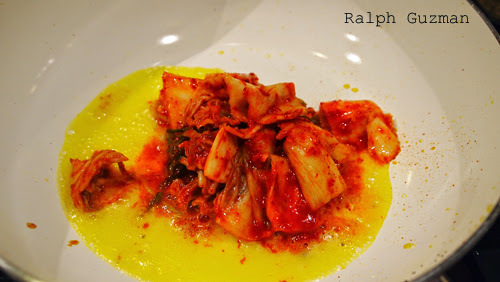 The kimchi lent its distinct but restrained and more refined flavor, thanks to the lemon. It also gained a creamy dimension because of the butter. The figs added a sweetness that complemented the kimchi very well, while the hazelnuts added crunch. And of course, the scallops were the stars of the show, wonderfully aided by the supporting actors. They were a party in my mouth, with all the ingredients harmoniously lined up to dance the conga! 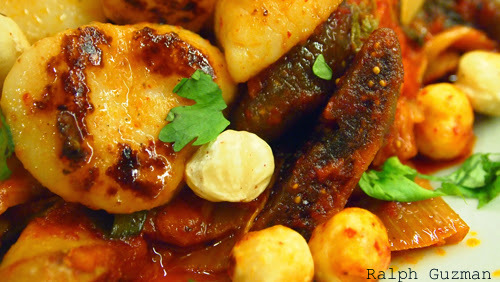 This entry was posted in Food + Recipes, Seafood and tagged Chicago Restaurants, Fusion Dish, ralph guzman recipes, RatedRalph.com, Seafood Fusion Recipe, Seared Scallops on Buttered Kimchi, The Girl and the Goat Recipes by Ralph. Bookmark the permalink.